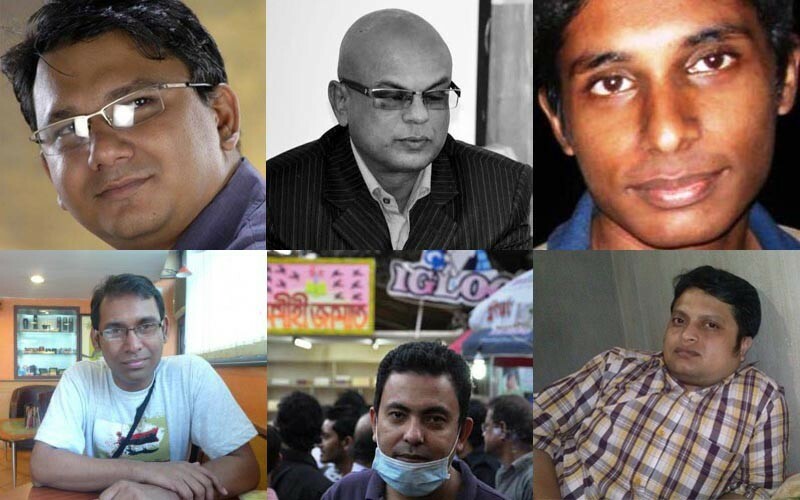 Secular writers killed in in Bangladesh between 2013-2015. From top left clockwise: Faisal Arefin Dipan, Shafiul Islam, Oyasiqur Rahman Babu, Rajib Haider, Avijit Roy and Ananta Bijoy Das. Since 2013, Bangladesh has witnessed a series of brutal killings of secular intellectuals by religious militants. As assailants have targeted an increasingly diverse set of people — from bloggers to academics and publishers, to gay rights activists and religious minorities — people have begun to look critically at the different entities involved. On the occasion of World Press Freedom Day, UNESCO organized a seminar in Bangladesh where the focus was on use of social media to resonate ‘false information’. The speakers expressed their worries about the use of social media to spread religious extremism and hatred as well as to infringe on individual freedom. Indeed, observers have begun pointing fingers at the government, mainstream media and social media, identifying specific ways in which each of these entities has contributed to the problem. Although the government is harsh on any views hurting religious sentiments, authorities have made little effort to stop these threats. Police always seem to arrive at the crime scene just moments after a murder has been committed and the perpetrator has fled. As for media, most of the deceased bloggers were openly threatened via social media before their killings, and violent extremist groups regularly claim responsibility for their deaths on Facebook or Twitter as well. Mainstream media regularly report on these incidents, but often publish personal information about targeted individuals that can increase their vulnerability to threats by militants. At the time, a complaint was filed against Joarder for allegedly making derogatory comments about the Prophet Mohammed. Joarder was then arrested and released after spending a few weeks in jail. Three locals have been detained in the murder case. In another example, Facebook user Noyon Chatterjee, who allegedly operates using a fake (and importantly, Hindu) identity openly shared the social media identities of professors and individuals on his website. When individuals are exposed in this way, they can easily fall prey to extremists. And social media is being used by militants not only to track and gain support, but also to incite mob violence. In September 2012, Bangladesh saw a string of violent attacks on Buddhist monasteries, shrines, and houses of Buddhist inhabitants in Ramu Upazila in Cox's Bazar District in Bangladesh by local mobs. The agitated mobs destroyed 12 Buddhist temples and monasteries and 50 houses in reaction to an image depicting the desecration of a Quran on the timeline of a fake Facebook account under a Buddhist male name. In both this and the previous case, individuals with malicious intentions posed as religious minorities as part of their effort to incite hatred and violence against religious minority groups. It also appears that extremists are tracking such information with the support of other netizens. In an article titled In Bangladesh, Call Facebook for Murder, writer Sudip Roy charted the activities of a Facebook page right after the killing of two LGBT Activists. The page celebrated the killings, and netizens took part in it, constantly providing information. The following documentary “Razor's Edge”, produced by anonymous blogger “Nastiker Dhormokotha” (religious talk of an atheist), is the winner of jury’s award in the Citizen Journalism category at the Deutsche Welle BOBs awards 2016. This reveals the life-threatening situation the secular bloggers are facing in Bangladesh. What are the ethics of reporting on people under threat? The primary reason Why Nikhil Chandra became the target 4 years later, is because she said something (or allegedly spread that he said) and the information has traveled to the right place. Though extremists are responsible for this killing, how the information reached to them remains to be explored. Today, a similar news story was published saying that (like Nikhil Chandra) a person has been arrested, accused of (according to complaint) making a Facebook comment which can be treated as “contempt” of religion. If you read the news, you can have an idea how the extremists learned about Nikhil Chandra. The first line of the news provides the name and age of the girl who was arrested (including nickname). Also, it includes information about the district and sub-district she was arrested in. The second paragraph even points out the local area, mentions her father's name, and notes that they own the house. Now from the news, anyone can locate the girl. To make it even easier to find this young woman's home, the news includes the girl's local police station as well. Other than journalists and the police (or the government), we get to know about a third side. Local people surrounded the house before the police came in. Just for a comment on Facebook, a citizen's life is placed in danger for a lifetime, by everyone around her. Indeed, the practice of discretion and verification of sources often seems to be missing within the journalist community. Social and mainstream media have failed to prioritize privacy and important ethical considerations when handling. Whether you support LGBT rights or you do not, the one thing that we must all agree on is that there can never be any justification for murder, and that those who are guilty of such savage slaughter are enemies of the state and of everything that is decent in humanity. Can Facebook do more to help? In 2015, the Bangladesh government blocked Facebook for 22 days citing threats to public security. The ban was lifted after government officials met with Facebook representatives and urged them to monitor or filter content that could be seen as provoking religious sentiment and conspiracies against the government. It is clear that police and government authorities could do much more to mitigate threats and hold perpetrators accountable for their crimes. It is also clear that mainstream media could take greater care to omit key private information about individuals who have faced threats or legal challenges concerning their online speech. But the responsibilities of social media platforms in this milieu, and Facebook in particular — as it is the most popular social media platform in Bangladesh — are more difficult to define. In April 2016, Facebook stated that it had complied with Bangladeshi government requests for the personal data of specific users who had violated local laws. Facebook administrators provided some data related to 16.67 percent of requests made by the government between July and December 2015, according to the company's latest Global Government Request Report. As per the report, the Bangladesh government made 12 requests seeking information on 31 Facebook users during the period. Within this time, Facebook restricted access to 4 pieces of content alleged to violate local law regarding blasphemy, pursuant to a request from the Bangladesh Telecommunication Regulatory Commission. While these measures may help mitigate threats and the proliferation of hateful messages and incitements to violence, these likely represent only a small fraction of cases in which people used Facebook to issue threats or incite violence against others. While all entities discussed here could take greater care to protect the privacy and safety of individuals facing threats from such groups, it is above all incumbent on the Bangladesh government to uphold the rule of law and protect public safety by working to prevent such attacks and to bring their perpetrators to justice.